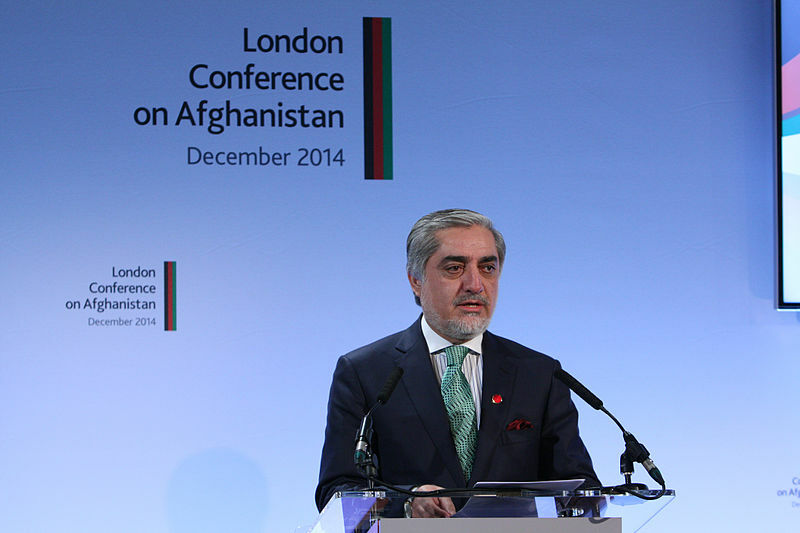 CEO of Afghanistan Abdullah Abdullah gives a welcome speech at the London Conference on Afghanistan in 2014. Creative Common: Patrick Tsui/FCO. With one of the world’s longest-running conflicts continuing to define everyday life in Afghanistan, it is no wonder that many citizens are unenthused by the upcoming leadership election. Adding to the sense of malaise is a cast of familiar faces who have done little to change the country for the better in the last five years. The Chief Executive of Afghanistan’s National Unity Government Abdullah Abdullah entered the presidential race for the third consecutive time on January 27, 2018, the last day of candidate registration for the July vote. He will be one of the more serious challengers for race favourite and incumbent President Ashraf Ghani — his bitter rival from the 2014 race. That was the second time Abdullah Abdullah had tasted electoral defeat, having also run and lost in 2009. But 2014 was especially painful for Abdullah as he had fallen just short of a first round victory with 45% of the votes. He accused Ghani and the Independent Election Commission of conspiracy and fraud after his defeat in the second but later struck a deal to form a National Unity Government (NUG) in which he took the newly created position of Chief Executive. Abdullah, whose confusing position is sometimes likened to that of a prime minister, has earned a reputation for style over substance during that period. Now 58-year-old Abdullah seems determined to chance his arm once more in the country where he trained as an eye doctor. A Kabul native, Abdullah is seen by many as a culturally Tajik despite his father’s Pashtun heritage. His mother was from Panjshir, a region dominated by the Tajik ethnic group, where his father served as a government employee. Abdullah attended Kabul Medical University and began working in a hospital in Kabul, but like so many others, was forced to evacuate to Pakistan shortly after the Soviet Union invaded Afghanistan. Later on in the 1980s he would provide treatment and healthcare for resistance fighters. It was during this period that he became associated with the leader of Tajik resistance forces Ahmad Shah Massoud. Eventually, he became an advisor, translator, and close aide to the commander, who was assassinated in 2001. Abdullah’s close relationship with Massoud is one of the main sources of his political capital among Tajiks, the second largest grouping in Afghanistan after Pashtuns. In 1992, the Northern Alliance along with other resistance forces against the Soviets formed a government in which Abdullah was appointed as foreign minister. During the Taliban’s rule, he continued serving as foreign minister in exile until the group was toppled by the U.S.-led coalition forces in 2001. From 2001 to 2006, Abdullah served as foreign minister under President Hamid Karzai, a position he left in order to compete in the 2009 vote. But many political commentators have argued that Abdullah’s political brand has not been helped by half a decade in the National Unity Government which has appeared hapless in its efforts to combat a swelling insurgency and provide basic services. A miscalculation if @afgexecutive & a JIA fraction think they can win #elections with photos of Khalili & Dostum.He doesn’t have a heavyweight Pashtun & it makes it impossible 4 him 2 become president. Possible that he may withdraw & support @ashrafghani‘s main challenger Atmar. Back in 2014, many had said that the ethnic composition of the electorate, favoring candidates from the dominant Pashtun group, meant that Abdullah would not survive a second-round contest against a strong Pashtun candidate. That turned out to be the case. Now many believe 2014 was Peak Abdullah, and that he will fall at the first hurdle this time. That is a shame for voters who would like to see a strong alternative to Ghani, whose administration has not delivered on his own promises of reform and a battle against corruption five years ago. Ghani’s most likely challenger, Hanif Atmar, is another Pashtun political insider who has struck a conciliatory tone with extreme conservative groups, including the Taliban, who he is keen to bring to the table for talks. Former Northern Alliance man Abdullah, meanwhile, is catching more eyes for his dress sense than his leadership bid. It would be great for you to join fashion and modeling as your future job.